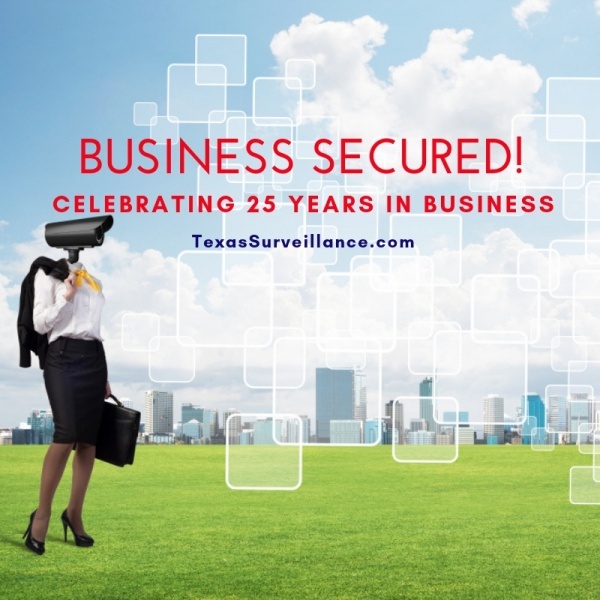 We at Texas Surveillance are extremely proud of celebrating a 25 year anniversary in providing Texas commercial and industrial clients with business security monitoring they can rely on. Our team always aims to provide the highest quality products, security cameras, surveillance systems and the most experienced technicians to get your workplace monitored and protected. When remote business security monitoring started, we rolled it out immediately to our clients. We understand that you can’t always be there as a business owner and having a network security camera system to monitor from wherever you are is essential. As technology advanced, so do we. We’ve been serving the Texas area for 25 years and will always be a step ahead when it comes to advanced equipment, placement, and techniques. Over the 25 years, we’ve seen in increase in business owners wanting to properly secure the workplace. Theft is a big issue, but besides that, asset protection, employee protection, and liability defense have become more relevant in recent years. As law suits against employers increase, business security monitoring serves as proof and evidence to relate a case clearly to all parties involved. If you own a business anywhere in the Texas area, retail store, office building, medical offices, or anything in between. We specialize specifically in commercial and industrial applications which defer greatly from housing security cameras. Placement, quality, 24/7 monitoring, and logistics are much more precise with business applications and we know business! We always offer an in depth on-site assessment, and provide you with a detailed quote that includes, material, labor, and a workflow of how the process works. Our goal is to work with your IT team or management to minimize the down time. Repairs, new installations and replacements are available 24/7 including holidays and weekends. We work around the clock so you don’t have to. Business security monitoring isn’t about “set it and forget it”, our team will always advise you on the latest innovations and equipment available to help keep your business assets secured. Contact us for a complimentary evaluation and we’ll be happy to review your commercial and industrial security monitoring needs. LET’S TALK BUSINESS SECURITY AND SURVEILLANCE….